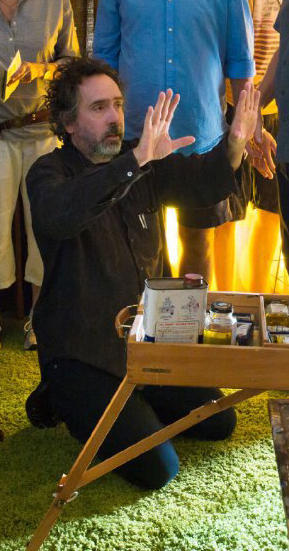 What fun is BIG EYES, the new film from that master of the oddball macabre, Tim Burton! Much of the fun occurs as we realize, while the movie meanders along, that is it very little like any other Burton work we've seen. It's so... gosh... normal. Sort of. Then we get to thinking that, really, this is the perfect subject for this oddball director: the story behind the story of those hugely popular paintings of the 1950s (and into the 60s), signed with the name Keane, of waif-like, big-eyed children designed to produce that cloying "Ooooooh" sound that eventually morphed into what was heard from the audience on countless Oprah television shows. Those children, and those paintings, were just so adorable that you could puke. At least, that's what TrustMovies thought of the "art" when he was a very young man, and his opinion hasn't changed now that's he an old one. Still, he very much enjoyed the movie based on this tale that Mr. Burton (shown at left) has brought to the screen with such bizarre finesse. 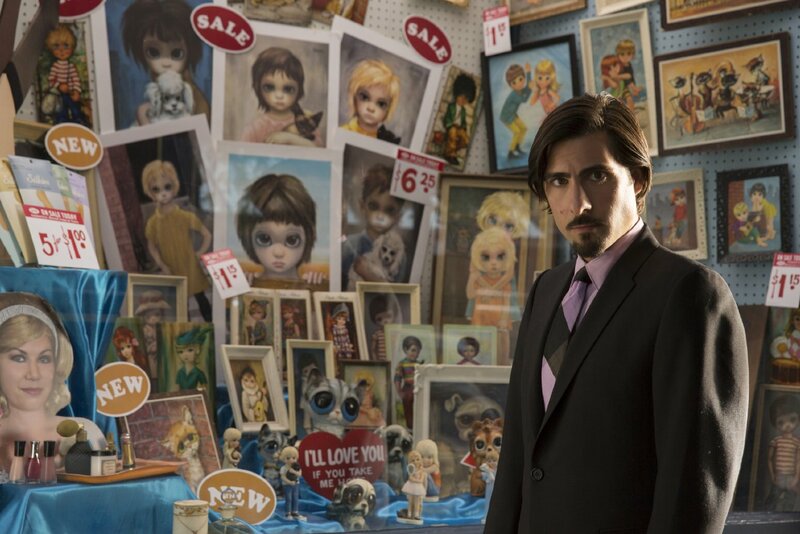 And there is indeed something macabre about the fact that so many Americans could fall for something so utterly kitsch as these cutesy/sad kids, each new one more nauseatingly sweet than its predecessor. But some of us did. Though art critics and dealers told us we were nuts, we just kept at it. And Burton's movie becomes a kind of rich, ironic guffaw at our expense that we were so taken in, not just by the ridiculous "art" itself, but by the husband-and-wife team responsible for it -- every bit as fake as its simpering product. 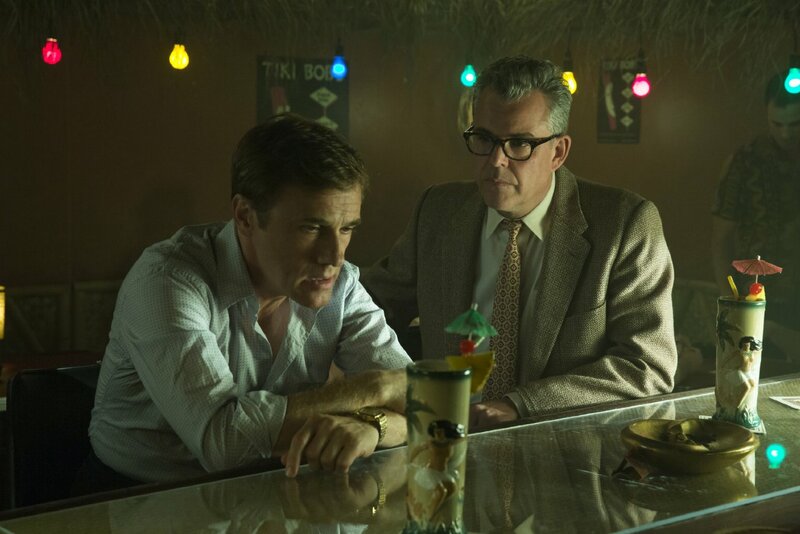 Burton begins his film with, appropriately, an unreliable narrator: a sleazy reporter played quite well by Danny Huston (below, right). The look of the film is an immediately recognizable (for us ancients, anyway) 1950s America, as though it were being photographed by television of that same era (except in color, which TV didn't have back then). We meet a sad-but-adorable Amy Adams (above), just divorced from her husband, and taking her young daughter with her on the road to a new life. 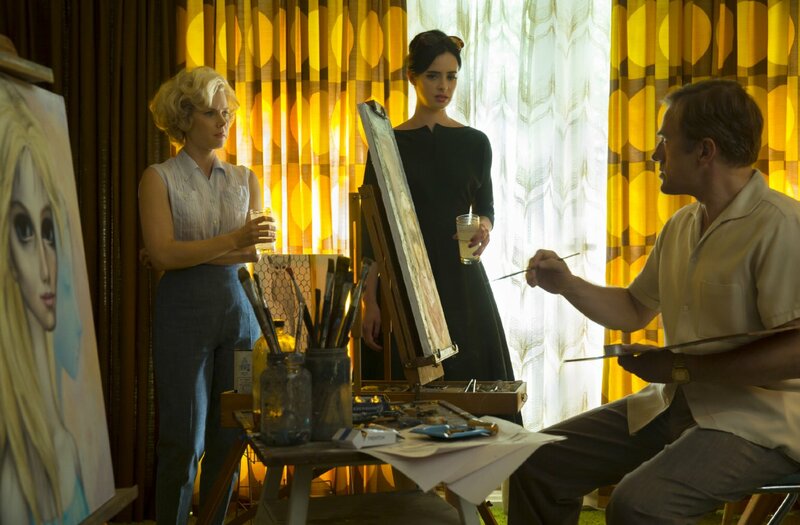 That life happens in San Francisco, where she gets help from an old and more sophisticated friend (played by Krysten Ritter, below, center), and soon meets and marries yet another loser (but one who at least appears to have a lot going for him) named Walter Keane (played in his best slightly-bizarro fashion by Christoph Waltz, above, left). Burton's film, written by the smart and successful team of Scott Alexander and Larry Karaszewski (Ed Wood and The People vs Larry Flynt), doesn't want to be too clever or stylish about its story -- which is already plenty strange enough to carry us easily along. Without giving the store away, let's just say that the art, and the people who created it, leave a lot to be desired in the "truth" department. The film will probably be seen as "early feminist," given the movie's time frame and the education of its main character in the ways of men and art. But this is somewhat problematic, since Margaret Keane was quite complicit in her being taken advantage of by her husband. And although the movie makes much of the triumphant court case involving hubby vs. wife, it fails to note that the case was overturned some years later, and Margaret got none of the money she was supposed to have been awarded. The art world of the time is seen mostly via the gulled public, but also through the eyes of a snippy gallery owner (played delightfully by Jason Schwartzman, above) and The NY Times art critic, John Canaday, played expertly by Terence Stamp. No less than Andy Warhol is supposed to have cited the Keane work as genuine art because it was so popular, but then few thinking people would accept a Warhol statement as anything approaching the genuine. Whatever. The film is mostly great fun -- with one definitive Burton touch in the scene in which all the characters we see suddenly have those huge Keane eyes -- as it tells (all from Margaret's viewpoint, to be sure) its rags-to-riches-to-something-less tale of would-be art, and the fart who sold it to us. 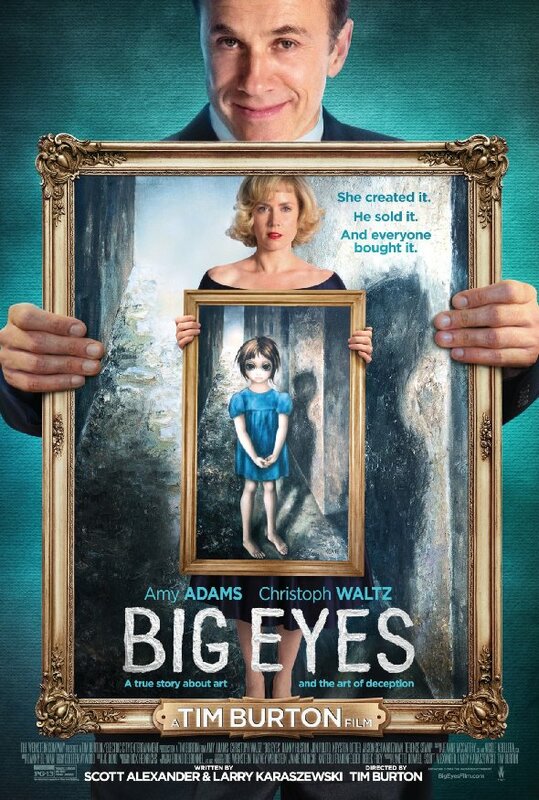 Big Eyes, from The Weinstein Company and running 105 minutes, opens across the country (well, L.A., NYC and Chicago, at least) in a limited release this Thursday, December 25. More cities will follow soon.